Announcing the winners of the 21st ever Right Place Photo Caption Contest! Presenting the top fifteen captions for this picture from Gary Hershorn/Files/Reuters via Yahoo! #15: AL: "I'm really not a monster. Actually, I have the heart of a child... I keep it in my desk drawer." #14: Mrs. Clinton thought a trip to Yankee Stadium would shore up her New Yorker bona fides. She didn't realize that the season had been over for two months. #13: Al Franken chats up the audience at Air America Radio's latest fundraiser, "Ben Affleck: A Retrospective in Film." 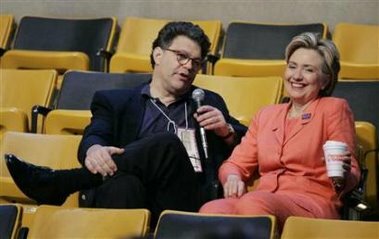 #12: In a stolen moment, Franken asks a receptive Rodham, "If I told you that you had a beautiful body, would you hold it against me?" "Oh, Al... I don't swing that way, and if I did? Well, the answer would still be no." #11: "...And then your husband asked me to crawl under his desk while Arafat was waiting outside." #10: "Why should you dump Bill and run off with me? Because I'm good enough, I'm smart enough, and doggone it, people like me!" #9: "Do you know what scalding hot coffee does to male genitalia, Al? Well, breathe garlic breath on me again, and you'll find out!" #8: "So... Hillary... do you like cigars?" #7: For want of a box of popcorn, Al Franken realizes that he has lost his one and only chance to play "jack-in-the-box" with Hillary Clinton. #6: "...And then Bill says, 'Yeah, I fantasize about Hillary... that just once she would wear a dress!'" #5: "We are here at the latest Cindy Sheehan book signing..."
#4: "An entire 6,000 seat arena takes a bathroom break at the precise moment you begin your karaoke rendition of Sometimes When We Touch? Take the freaking hint, Al!" #3: Unfortunately, Harry "Curly" Reid was unable to make it to Media Day for the Three Stooges remake. #2: "Thank you for that lovely rendition of Spinal Tap's Big Bottom. By the way, Al, have you ever been to Fort Marcy Park?" #1: "Look, Al, for the last time, if I'm going to pay for advertising, I'm going to put it on a radio station that people listen to." BONUS: A special photoshop award this week to (drumroll)... I. Ronnie! "So... Hillary... do you like cigars?" More Frequent Flyers Club Mileage Awarded! The Best Blog Posts of 2005! Congratulations 2005 Weblog Awards Finalists! Presenting: The DNC's "Sounds of the Season"